The delicious cookies pictured above contain a tasty surprise filling--cocaine. Earlier this month, Mauricio Isidro Rivera Hernandez arrived at Newark Liberty International Airport in New Jersey from Guatemala, his home country, with scores of cookies in his checked luggage. Since New Jersey is known for its bountiful supply of cookies, pastries, and assorted sweets, the 30-year-old Rivera Hernandez had his luggage searched. 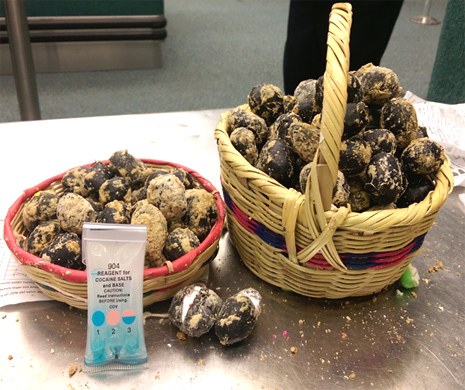 “Upon further inspection of the cookies” by U. S. Customs and Border Protection agents, investigators reported, the baked goods were found to contain, in aggregate, 118 oval-shaped pellets containing cocaine. The cookies, investigators determined, held slightly more than three pounds of cocaine, which carries a street value of $52,000. Rivera Hernandez is facing a state narcotics smuggling rap. His cookies were seized by federal agents, who also confiscated those wicker baskets.